I'm a huge fan of "The Cat in the Hat's Learning Library" and this particular title was great to read to a preschool group. Since it utilizes the Cat in the Hat and the illustrations are incredible similar to Dr. Seuss' himself it easily kept the attention of the little ones, but the rhyming text gave a surprising amount of information. I also used it as a gentle introduction to fiction and nonfiction. I like what this book teaches about birds but I'm not sure I like the Dr. Seuss theme. You expect a certain style when you read Dr. Seuss, and I don't think that can be easily replicated by others... Nor does it need to be.Aside from the intro and close, this book is clearly focused on education, which is fine, but it's Seuss-like illustrations might actually interfere with that purpose. Seuss would take you to an imaginary place to indirectly teach you a very real moral lesson. I'm not sure if the same can be done for a direct-education reference-style book (there's even an index in the back). Fantastic! 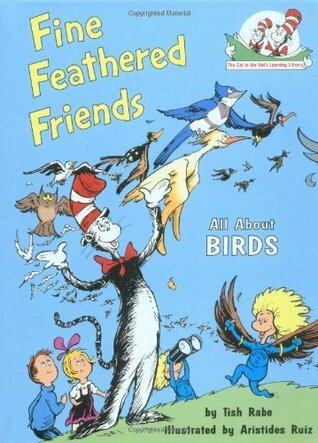 This book gives tons of information on birds, all with the rythmn and rhyme that you expect from a Dr. Seuss book! (Well, I guess I should say cat in the hat learning library -- the book is written by Tish Rabe)You will learn about birds names, appearances, behaviors/quirks and anatomy. Everything is simply put and easy to understand.The book also includes a glossary in the back in case your child is unfamiliar with any of the terminology. This was a nice 'Science' book for younger readers without 'being in their face' about facts and things about birds. Nicely written in a way that is fun to read-listen to without being overwhelming about just stats and facts. A wide range of birds and why they are called what they are and where they live and what they do. This book is a great way to introduce birds for whatever lesson need to be taught. Habitats, traits of and animal and how they survive,are all good lesson. I even learned something new. Since this is a book based off Dr.Seuss's word it is also a great book to teach rhyme. Also great book for the student who is also a bird enthusiasts. Same mistake as always. Giving identifying sounds saying ducks quack, and showing drake Mallard.The hen Mallard does quack, but drake does not. Not many ducks in the wild quack.Small thing, but those of you who know me understand. Like the book "I Can Name 50 Tress," this book is fun and instructive. Don't expect an Audubon encycleopedia; it is in the Dr. Seuss library. The illustrations, as always, are delightful and true enough to be helpful. Great gift idea. Fun to share with children and learn together. Lots of interesting information on birds in contained in this book. My kids wanted to know if whooping cranes really do dance! Education that rhymes is the best. I enjoyed this book because I like birds. I also enjoyed this book because I like Cat in the Hat books. I loved reading this book to my daughter. The book was so informative and colobus and fun as well. Lot of facts about birds, like how they are named, their habits, their habitat have been learnt by me through this book. It's amazing to seeing how all the details about birds are put together in such a simple way for kids to learn.